Looking to save money on your garden design and cut back on the cost of garden landscaping? Without a dedicated budget, the garden often becomes a list of endless weekend jobs that will, or will not, be completed at some point in the future. However, what shouldn't be under-estimated is how a well-designed, stylish garden can increase the value and desirability of your home. Creating the perfect garden design is an expensive job, with outgoings to consider including the cost of hard landscaping, accessories and regular, year-round maintenance, but there are several surefire ways to add value to your garden even if you are on a budget. Find out more about planning, designing and costing your garden transformation in our comprehensive guide and consult our sourcebook of top garden suppliers. Some garden designers will recommend spending 5 to 15 per cent of the house value on the garden/landscape, which, in turn, will add a similar, if not larger amount, to the value of your home. Others talk about allocating at least £100 per square metre of garden, although some will double this figure. A totally new garden does cost more than you think, even if you keep some existing features. It’s very hard to complete even a small garden with a relatively simple design for less than £6,000 to £7,000 once design fees, materials, plants and employing contractors (which normally amount to at least half the budget) are factored in. Most new garden designs cost in excess of £10,000, and that’s for a small garden. A suburban garden will probably be in the region of £17,000 to £25,000. This might seem a lot, but consider what you might spend on a quality kitchen or bathroom and how much this adds to the value of your home and quality of life. Work out how much you can afford to spend and seek advice on how to maximise your budget for the best results. Unfortunately, setting a simple rate for metres squared or percentage of house value isn’t the most reliable way to work out the cost of garden landscaping, as there are so many options and it will largely depend on your chosen design, the state of the plot when you begin, and the elements you wish to include. Find out how to employ a garden designer. A small garden full of hard landscaping, garden lighting and a bespoke water feature might well cost more than a typical suburban garden that can accommodate a large lawn and more planting, which significantly helps to keep down costs. Think about each element you want to include, such as water features, fencing, shades, garden furniture, an outdoor kitchen or outdoor dining area, decking, sheds and summerhouses, and large plants, and research how much each one will cost. Contemporary, minimalist designs, particularly those with complex and clinical hardscape, are expensive, as are design details that have no tolerance for change. With a tight budget, opt for a more traditional look, or materials like woven hazel or flint, where some imperfection is part of its charm. A garden that is sloped, has insufficient drainage, or structural elements that need to be removed, such as walls, garden rooms or old paving, will cost more to redesign as the initial outlay for the preparatory works will be higher than when dealing with a plain, flat area. A subtle change in level can help make a smaller garden feel larger, but significant excavations are expensive. There’s the soil to remove, not to mention retaining walls, and perhaps the professional fees of a structural engineer to add to the costs of garden landscaping. This explains why sloping gardens generally cost more, and can be very expensive, especially if you plan to terrace the whole site. Find out how to make the most of a sloping garden in our guide. Demolition and site clearance can cost a lot, especially if access is tricky and work needs to be done by hand. A small garden that needs a lot of clearance, and that has poor access, might easily cost £1,500 to £2,000 to do. If the overall budget is £10,000, that only leaves £8,000 for everything else, so, wherever possible, reuse or recycle – an old concrete pad could be crushed and used for new footings. Remember, a large overall sum for a redesign doesn’t need to be spent all at once. Implementing a design proposal can be phased as and when money is available. So, in year one, construct the hard landscape, for example, such as the patio, walls and paths. Build ponds, pergolas and water features (unless they’re built-in) in year two and plant in year three. An experienced garden designer can save you time and money in the long term. Professional garden designers can help from planning the entire garden and managing contractors, to guidance on where best to proportion your budget. At the very least, consider a day’s consultancy to give you some ideas to work with. The initial cost might seem unnecessary, but it will save money in the long term, and the new ideas will be invaluable. Search online, checking out client testimonials, or visit the Society of Garden Designers and the British Association of Landscape Industries. Complex curved walls, fences and patterns in paving cost a lot, as they are tricky to create. Garden building materials are usually designed for simple spaces, so adapting them for different angles and curves will result in some wastage. Simple straight runs are far easier to build and usually look better, especially in urban and suburban gardens where unity between the garden and your home’s architecture is important. Gardens on a slope can be expensive to redesign, and sometimes there’s little above ground to show for the time and money you’ve invested. Go for a design that minimises the need for extensive groundworks, foundations and drainage. One or two level plateaus built into the slope, for somewhere to site a dining table or a couple of sun loungers, could be enough ‘useable’ space. Solutions such as decking are also useful, needing just a few foundations for the sub-frame, unlike paved areas, which are either built on top of, or into, a slope. Find out more about designing a sloping garden in our dedicated feature. Discover which are the best decking materials for your space, and don't miss our decking ideas for inspiration. There’s always a way to reduce the costs of garden landscaping. Dry stacked stone or rendered blockwork costs less than ‘faced’ brickwork, while Western red cedar decking is cheaper than other decking timber, and works just as well. For seating areas, a solid surface is essential, but elsewhere gravel, or even bark, will do. Both are easy to lay on landscape fabric to keep the weeds down, and you can break up a large area of gravel with oak sleepers or ground cover planting. Find out how to choose the best gravel for your garden. 'If you live in a red-brick property, for a harmonious look try dark greys or warm earthy tones, and steer away from buff or yellow. If you live in a limestone property, warm, similar-toned paving and chippings will ultimately look best,' says Paul Harvey-Brookes, RHS judge and award-winning garden designer. 'When planning paving, you can reduce the cost by infilling with gravel, and replacing natural stone with cast pavers can look equally as good and save money. Use our guide to choose the best patio paving for your garden. An expanse of concrete or an unattractive boundary wall doesn’t always require removal and replacement; you could cover or clad it instead. For vertical surfaces, close-knit trellis, woven hazel hurdles, thinly spaced cedar strips attached to wooden battens behind, coloured concrete render. We have plenty garden fence design ideas for you to consider. Removing lots of heavy flooring is expensive, not to mention back-breaking work. If it’s thick and the surface is sound, it could be the perfect sub-base for attractive exterior tiles, as long as adding them won’t raise the height so much that the damp-proof course of the house is compromised. Recycled materials often look better than new, particularly around traditional buildings, and it’s possible to pick up a bargain. Reclamation yards can be pricey, especially those in cities, so take a day trip out to a country yard, as most will deliver. Check Ebay, Gumtree and Freecycle as well as supermarket classifieds. You might not spot exactly what you originally wanted, but with a little imagination it’s possible to create truly unique features from your finds. Labour costs can be more than 60 per cent of a garden redesign, so spend time considering what you can do yourself. 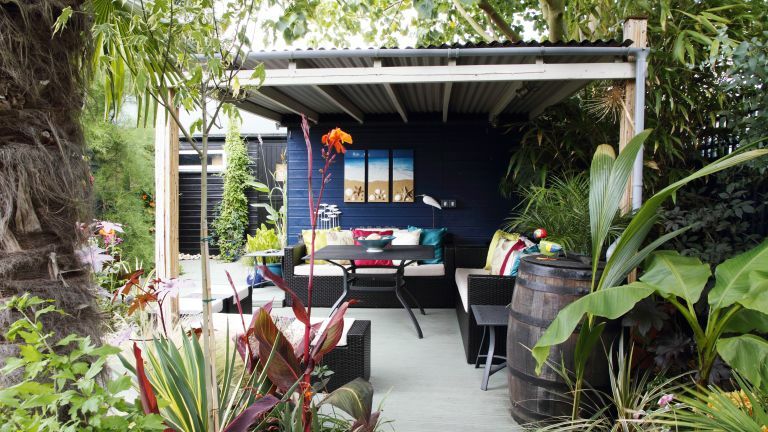 Planting, laying a new lawn, erecting kit-form pergolas and arches, timber raised beds, simple plumbing – even a deck – are well within the scope of the DIY enthusiast. Find out how to install decking in our step-by-step guide. You should know your limits, though. Paving, brickwork, extensive garden lighting and features such as dry-stone walls will need specialists. Choose local tradespeople to keep expenditure to a minimum. Use Checkatrade to find a local tradesman at the best price. This is the easiest piece of advice for anyone looking to save money in their garden. Flowers are inexpensive, decorative and are often the first thing that guests are drawn to. They’re especially effective in a small space, on a terrace or patio, or in a courtyard without a lawn. You can create an impressive floral arrangement by using pots and planters if you don’t have space for beds. This will be easy to maintain and if you get bored, it is easy to move around and change. If you have a lot of space for beds, try to add plants that flower at different times in the year, so that there is always something interesting going on. Get more advice on choosing plants for your garden. Create impact with trees, larger shrubs and hedges, especially those used for privacy, screening and security. Specimen plants give a garden an instant sense of substance and proportion, which is difficult to achieve otherwise. Discover how to make an impact with mature plants. Using trees (see our pick of the best small trees) to create a ceiling for your garden, in the same way a pergola or gazebo would, is always going to be the cheaper option. The same can be said for borders, instead of paying a contractor to build a fence, invest in hedges, climbing plants and grasses to define the border and increase garden privacy and security. Use our guide to creating living walls and vertical gardens for more information and inspiration. Remember to use a mixture of good- value shrubs, including those that will flower, fruit or have interesting autumn foliage, such as Sarcococca confusa or Viburnum. Use these with a mixture of spring, summer and autumn flowering herbaceous perennials. These come back year after year without the need to buy again, so they are long lasting and relatively low maintenance, as well as representing great value for money. Work out the total number of square metres of your planting beds and allow five shrubs or perennials for each metre. Shop around at garden centres and nurseries and expect to pay between £4 and £8 for a two-litre pot. Join a local gardening club and pick up knowledge and cuttings or small plants for sale at a discounted rate, saving more to make your budget go further. Herbaceous perennials such as lavender and rosemary do especially well in garden borders, year after year. We have lots more tips for creating beautiful garden borders. Garden lighting adds another dimension to any garden, as well as potentially extending the time you can spend outdoors. Use lighting to illuminate trees, beds, water features and sculptures and it will feel like a completely different space at night. Waterproof festoon lights are a flexible, temporary and cheap solution to lighting your garden, and they will create a comfortable and casual atmosphere. Cheaper spotlights are useful where fittings will be hidden by foliage, so you will save money if you decide to conceal your garden lighting. If you plan on spending a little more money, go for attractive fittings that will double as decorative features. We have the best garden lighting from fairy lights to wall lanterns in our buyer's guide. Always consult a qualified electrician for anything other than simple clip-together systems. Cable runs and the associated pipework need to be factored in very early on, even if you actually plan to install the system itself later, when further funds are available.